The majority of Brazilian horse owners and handlers believe that horses have the ability to feel fear, pain and joy. Many owners also felt that horses could feel both boredom and jealousy. 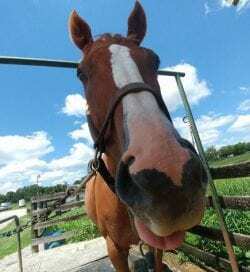 While some would feel that these attributions of emotion to horses are examples of anthropomorphism, researchers from the Federal University of Santa Catarina in Brazil said that these beliefs were rooted in research. The study team consisted of Maria Hötzel, Michele Vieira and Denise Leme, and was reported in the Journal of Veterinary Behavior. In total, 275 women and 412 men took the survey; horse owners comprised 81 percent of respondents, riding instructors were 8 percent and horse-care administers were 8 percent of respondents. Animal scientists and veterinarians also took part in the survey. In total, 63 percent of responders considered themselves experienced in the equestrian world. The responses showed that 94 percent of responders felt that horses had the capacity to feel pain; 92 percent thought they could feel fear and 77 percent thought horses could feel joy; in addition, 65 percent felt horses could feel boredom and 41 percent thought horses could be jealous. More women than men believed that horses could feel a range of emotion, and experienced horse owners were more likely to believe that horses had emotional capacity. The research team feels that these findings could be used to form educational programs to improve the welfare of horses, minimizing pain, fear, frustration and boredom. Read more at the Journal of Veterinary Behavior. This entry was posted in Horse Care and tagged boredom, Denise Leme, emotion, fear, Federal University of Santa Catarina, jealous, Journal of Veterinary Behavior, Maria Hötzel, Michele Vieira, online survey, pain, scientist, veterinarian by Paulick Report Staff. Bookmark the permalink.